Direct Marketing Tool. CatchAPage captures data from web pages (yellow, super, etc.) anywhere in the world and saves it to Excel. Pay-per-line system. 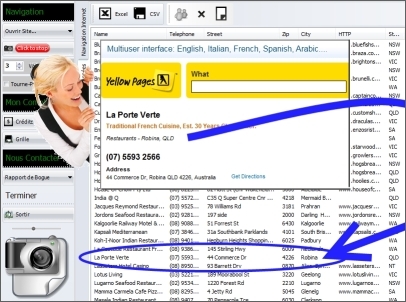 Also works with Chinese, Russian, Czeck, Slovakian, Arabic yellowpages... does SuperPages USA, YellowPages Australia, KlickTel Germany, Paginas Amarillas Argentina, Gelbeseiten, Venezuela, Greece, etc.